Thought of the Day | 17.11.15 | Change For the Better? The plans for a new Formula One in 2017 have been fairly well documented since the first few rumours were spread on the internet earlier this year and whilst the changes have been met somewhat positively, there of course have been critics. The new formula proposes quicker, more aggressive cars like the snarling beasts of old, just without the big, Bovril powered heart in the back, emitting tones similar to that of the God of Thunder gargling nails. Whilst fans of the sport should accept the positivity of the changes – we all want more aesthetically pleasing (no more phallic objects on the front, basically) and faster cars, racing has to come first and there are a few fundamental flaws in the plan. Firstly, the endgame of the V8 era was met with mixed reactions – some thought this would bring the old V6 turbos back and with that, nostalgic, Chewits fuelled memories of Senna and Prost flying round the tracks in the all-conquering McLaren MP4/4. Others didn’t like the end of the naturally aspirated era; no more V12’s, V8’s or worst of all – V10’s. And then, Mercedes uploaded a video on their YouTube channel showcasing a virtual lap around Monza, giving us an idea of how these new ‘power units’ would sound. As Richard Hammond once said on Top Gear “We didn’t like vacuum cleaners once, but now we live with them”. True, but we’ve never had to listen to leaf blowers for just shy of two hours in the name of entertainment. Although they are so very developed and intriguing, it’s not quite ‘F1’ – we want to be wowed with a cacophony of wonderful, loud sounds – each octave more glorious and adrenaline inducing as the last. But, they stay for now – and given the placid stubbornness of the four current engine suppliers, that’s highly unlikely to change – despite Bernie’s pleas. Rumours of 2.5 litre V6 turbos with no hybrid basis, no fuel flow, engine durability or rev limits are floating around the web – potentially equalling up to 1,000 brake horsepower, a lot closer to the 1.5 litre BMW M12 territory – enough to ruffle your hair somewhat on a Sunday drive. That’s not the main problem though. 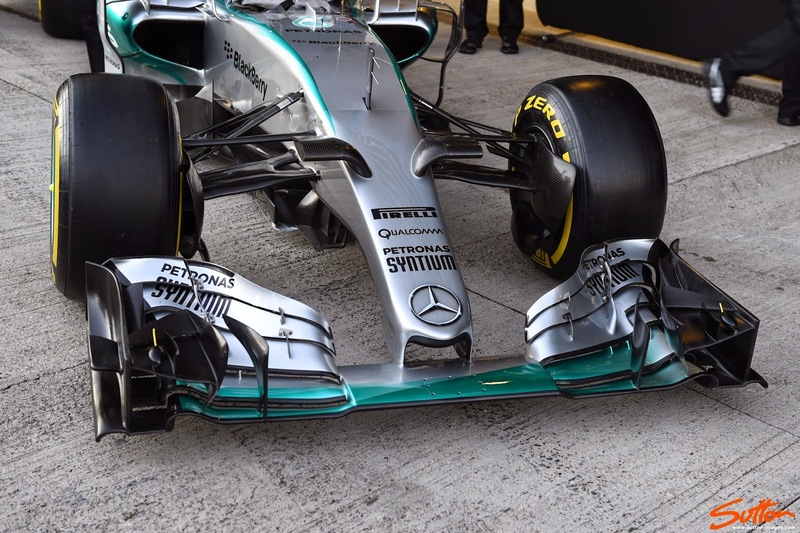 The main gripe the general fan base of the sport has is still with those intricate front wing assemblies. Here’s an example of the front end of the Mercedes W06 hybrid. Look at all the elements, all the little meticulously sculpted and placed pieces of super light and brittle carbon fibre. No wonder cars can’t follow each other – any hint of turbulence would throw the balance of the assembly right off. As a result, we get less wheel to wheel racing, less action and boring races for drivers and fans alike when there’s no rain or a Safety Car. The solution – a simpler front wing assembly. Just a main body and two end plates with slots for adequate air flow. We managed it years ago, why not now? Lastly, the tyres. Pirelli are confirmed to be the tyre supplier for Formula 1 until 2019. A little while back, Martin Brundle trialled the 18 inch rims on a GP2 car around Monaco and gave largely positive feedback. What’s wanted is a more durable tyre, made evident by Lewis Hamilton on Sunday as he complained of high degradation when following Nico Rosberg for the lead, he then dropped off by around 1.5 seconds from the German in the proceeding laps. Whilst that may be Rosberg simply flicking a switch, toying with Hamilton, something does have to be done with the durability of the tyres. Mercifully, we are a long way past the Silverstone debacle of 2013 – with Pirelli rubber strewn around the fields of Buckinghamshire, in the most intense, fast paced and expensive game of Dodgeball ever held. Pirelli’s first prototype is looking to make F1 3 seconds a lap faster, which will go some way to achieving the proposed 5 second slash of lap times. The idea of having bigger tyres at the rear of the car is foolproof, a tried and tested formula in the sport. Whilst the sound may not be as deafening, the cars will be quicker and more aggressive – and will hopefully deliver better racing. If costs can be kept down, allowing more teams and talented drivers into the sport, it might, just might be a huge step towards a more exciting future. And at the end of the day, that’s what we want. Simple, isn’t it?